The landscape and people of Myanmar provide wonderful photographic moments at every corner, let's capture them all! Sunrise and sunset shoots over the plains of Bagan which are dotted with over 4000 temples and stupas. Contemplate Bagan, the largest and densest concentration of Buddhist temples, pagodas, stupas and ruins in the world. Upon arrival, pick up by our tour guide and transfer to the hotel in the city centre. 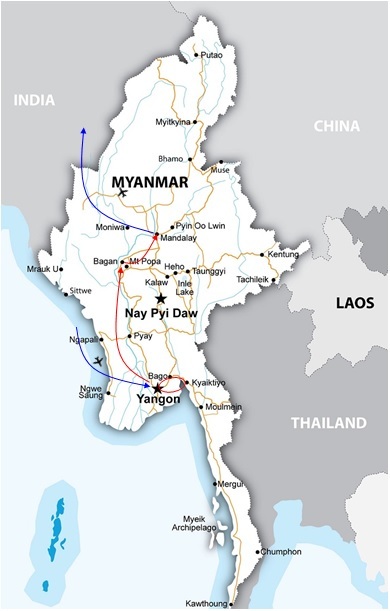 Yangon, formerly known as Rangoon, is a relatively quiet and charming city. Its impressive colonial and spiritual heritage makes it one of the most fascinating cities in Southeast Asia. Standard check in time is 14h00, early check in upon availability. This afternoon, we transfer to visit Sule Pagoda, a 2200-year-old temple surrounded by government buildings and commercial shop. Walk from here to Mahabandoola Park and visit the Independent Monument. Continue our tour by car, passing City Hall, little india and little china, Strand road and Yangon Jetty. We then visit Bogyoke Market, formerly known as Scott’s Market, browse through the wide selection of Myanmar handicrafts and other goods (Note: closed on Mondays and public holidays). End our tour today at Shwedagon Pagoda, one of the wonders of the world. It was built 2500 years ago and enshrined with hair relics of Buddha and a place where to meet devoted Buddhists meditating and praying. Enjoy breathtaking views of the golden stupa from this vantage point. We will spend around two to three hours at Shwedagon for visiting and taking pictures before coming back to the hotel. Overnight in Yangon. After breakfast and check out hotel, this morning your guide and car will pick up from your hotel and we’ll take a journey by road to Kyaikhtiyo, the Golden Rock. On the way, we’ll stop in Htaukkyan township to visit the Allied War Cemetery. This beautifully-landscaped, peaceful area is the final resting place for more than 27,000 Allied Soldiers who perished during the World War II campaign in Myanmar. Arrive at Kyaikhtiyo base camp (approximately 5hrs), travel by open-air truck along a winding road (1 hour). You be dropped off at bus station on the top of the hill. After a few minutes walking, we will reach the Golden Rock. A huge boulder covered by gold leaf and delicately balanced on the edge of a cliff, Golden Rock is one of Myanmar's main pilgrimage sites. The pagoda here is said to hold a hair of the Buddha and Buddhists from across the country come here to pay homage. Take photos of the pagoda at sunset before check in hotel and stay overnight. Wake up early to take photos of Golden Rock at sunrise, when many Buddhists flock here for pilgrimage. Walk back to the hotel for breakfast and check out. We then return to the base camp by open-air truck and begin the return journey to Yangon, via the excavation site of King Bayinnaung, who reigned Myanmar during the Toungoo Dynasty for 30 years. Visit a handicraft cottage and a monastery at Bago on the way back. End the day with a tour to a local pottery village to photograp traditional Myanmar pottery made manually hereby. On arrival Yangon, check in hotel and relax. Overnight in Yangon. After breakfast and check out hotel, we transfer to the airport for the flight to Bagan. Bagan, located on the banks of the Ayeyarwady (Irrawaddy) River, is home to the largest and densest concentration of Buddhist temples, pagodas, stupas and ruins in the world with many dating from the 11th and 12th centuries. On arrival, pick up by our local guide at the airport and transfer to an elevated temple for a panoramic view of the magnificent plains of Bagan. Continue to visit the golden Shwezigon Pagoda, first and prototype monument, which was built in Myanmar style in 1087. Go on to the Htilominlo pagoda, famed for its original fine plaster carvings and glazed sandstone decoration which are remarkably well-preserved. The temple stands 46m high and houses four Buddha statues on the lower and upper floors. In the afternoon, continue to the Mingalazedi pagoda, which is one of the few temples in Bagan with a full set of glazed terra cotta tiles. Finally, we will visit the Dhammayangyi pagoda, Bagan’s largest temple. The temple is in a large square, single story, pyramidal shape with six monumental ascending exterior terraces. The brickwork is perhaps the finest that can be found around Bagan. End the day with an unforgettable sunset view over the plains from the upper terrace of one of the temples. Transfer to the hotel to check in and relax. Overnight in Bagan. Early morning enjoy the sunrise over Bagan in a hot air balloon and take photographs from the air. Back to the hotel for breakfast. Start our horsecart tour in Bagan (2 people maximum on each cart) with a visit to Minnanthuvillage and 13th century-styled pagodas, go on to enjoy daily activities of the locals at Pwa-saw village. Try our temple photograph skills on a tour of the Payathonezu temple with its colorful religious paintings, then visit Thanbula pagoda, Lawkananda pagoda, Ashae-Pet-leik and Anauk-Pet-leik pagodas. In the afternoon, visit Sulamani temple, Dhamayangyi temple, then go on to a lacquerware workshop to see the craftsmen at work and learn from them their techniques. Enjoy breathtaking sunset by horse cart ride, an extremely memorable experience about Bagan. Back to the hotel in the late afternoon. Overnight in Bagan. Please note: The cost of the balloons are separated as they are operated until 31 March annually and not functional in the low season until 1 October or later. In low season, the balloon will be replaced by the whole day visit by horsecart. After breakfast and check out hotel, we transfer to the airport for the flight to Mandalay. Mandalay is Myanmar's cultural capital. The nature focus of the city is an abrupt hill, rising above a vast moated and walled square. On arrival, pick up by our local tour guide and transfer to visit Amarapura, a former capital whose name means ‘City of Immortality’. First visit Mahagandayon monastery, when over one-thousand monks reside and proceed to visit ne-thousand monks reside and visit a silk weaving workshop which produces exquisite handmade products. Continue to Ava which is one of the ancient cities and a remarkably rural backwater of empty fields sparsely dotted with widely spaced ruins, monastic buildings and stupas. Explore Ava by plodding horse cart to visit BagayaKyaung (a wonderful teak monastery), MahaAungmyeBonzan monastery (built of stucco-covered brick, royal monastery temple) and Nanmyin (a leaning watchtower of Ava). Transfer to Sagaing by crossing a bridge over the Irrawaddy River. Uncountable white-and-gold stupas are highlights of Sagaing. Sagaing Hill is widely regarded as the religious center of Myanmar. It is home to 3,000 monks and 100 meditation centers and you will visit pagodas such as Swan OoPon Nya Shin and U Min ThoneSae. We’ll also visit Sagaing’s local market, a typical Burmese market that few tourists visit. Here you will find a range of items for sale includinglocally made pottery, silver and other handicrafts. We will also stop at a small pottery village to see the process of making the ubiquitous water pots found throughout Myanmar. After touring this tranquil site, continue to U Bein Bridge, the world’s longest and 200 year-old teak bridge. Enjoy a stroll along the bridge and the fabulous views of the surrounding farms and streams. Transfer to check in hotel and relax. Overnight in Mandalay. After breakfast, we drive to Kywezon Jetty to photograph busy riverside activities in the morning and take a local riverboat to the ancient capital of Mingun (appx one hour each way), home to the world’s largest ringing bell, which weighs over 87 tons. Pay a visit to the site of the bell and continue to the unfinished Mingun Mantara pagoda, built in late 18th century by King Bodawpaya. A massive earthquake then had made upper portion of the pagoda collapse but the site is still impressive and remarkable. Visit Settawya pagoda, walk to the huge Mingun Bell (90 tons), and the Hsinbyume pagoda nearby. Back to Mandalay by boat, visit cottage crafts as the gold leaf making industry, tapestry, wood carving, bronze making, and marble stone carving. Go on to the Golden Palace Monastery, located close to Mandalay Hill, built in early 19th century, being famous for its teakwood carvings of Buddhist myths. Also at the foothill of Mandalay Hill situated Kuthodaw pagoda, built in 1857 and home to the world’s largest. Drive up to Mandalay Hill, which is home to many religious sites, and photograph the magnificent sunset from the 230m high summit. Overnight in Mandalay. After breakfast, at leisure until check out hotel and transfer to the airport for the departure flight. Standard hotel check-out time is 12h00 (late check out upon availability).